Seadrill Ltd. Deep Dive: How Long Can It Survive Low Oil Prices? Even when the oil downturn reverses course and oil prices start to rise, it will take a long time for offshore drilling to recover. How long can Seadrill make it before a lack of work puts the company at serious risk? Seadrill could face its stormiest seas yet in 2016. Image source: Seadrill. Here's a data point that should make it starkly clear just how far Seadrill Ltd.'s (NYSE:SDRL) prospects have fallen: Before stopping dividend payments in 2014, the company had paid out $1.94 billion in cash dividends in the prior 12 months. You could buy the company twice over with that much cash today -- though you'd also have to assume over $10 billion in long-term debt. Depending on your point of view, there is either tremendous upside potential, or huge risk, even at these levels. The truth? Probably a bit of both, with the axis resting squarely on oil prices, that unknown -- unknowable -- number that guides the path of hundreds of companies in the energy business. Instead of focusing on whether Seadrill will or won't make it, a better exercise is to evaluate the company's book of business and its costs and determine how long the company should be able to weather the current downturn. Once we've figured out how much business the company has locked up today and how long those revenues will sustain the company, it becomes a little easier to think about the longer-term prospects. Without further ado, let's take a deeper look. The best place to start when looking at a company in a situation like Seadrill's, is its cost structure. The company will be able to make some cost reductions, as it already has, but there's only so much it can cut. Here's a closer look at its expenses in key categories, primarily cash costs. General and administrative: $55 million in Q3; $181 million through three quarters. $315 million in G&A in 2014. Vessel/rig operating expenses: $374 million in Q3, down from $521 million in Q3 2014. $1.24 billion through three quarters of 2015, down from $1.45 billion in same 2014 period. 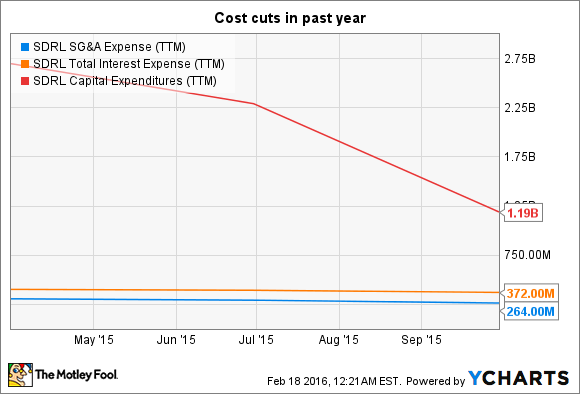 Interest expense: $105 million in Q3, down from $114 million in 2014 Q3. $317 million through first three quarters of 2015, down from $356 million in same 2014 period. Seadrill has reduced operating costs, and its debt-reduction effort has also reduced the expense. But at the same time, some of that debt expense reduction is a product of dropping assets -- and the related debt -- down to its subsidiary Seadrill Partners LLC (NYSE:SDLP) in mid-2015. So while that debt may be off the balance sheet, Seadrill also loses much of the financial benefit of the assets. Furthermore, vessel and rig operating expenses are largely a product of operating those vessels under contracts, and can only be cut so far. There is a risk of cutting costs too much, especially if it involves deferring maintenance, reducing staff, or anything else that could reduce a vessel's productivity or safety, or simply lead to higher costs down the road. SDRL SG&A Expense (TTM) data by YCharts. Last quarter, Seadrill spent $534 million last quarter on interest and operating expenses, or $2.14 billion on an annualized basis. On the Q3 earnings call, CEO Per Wullf said that the company was targeting $600 million in cash cost savings for full-year 2015, with a third of that in sustainable cost reductions and two-thirds in deferred costs. Besides the cash costs above, Seadrill has capital expenses related to its newbuild program, and debt maturities that it must either refinance or pay off. According to the company's most recent quarterly Securities and Exchange Commission filing from November, Seadrill has $1.65 billion in debt maturing in the next 12 months and another $1.74 billion in "other" current liabilities, which is likely primarily fees owed to shipyards for newbuildings scheduled for delivery. Combined, that's $3.4 billion in capital due in the next 12 months. So far, the company has used some of each of these things, both out of necessity and based on the best option available. As things stand today, Seadrill management has made progress on delaying and deferring newbuilds. To start 2015, Seadrill had 13 newbuilds scheduled for delivery in 2015 and 2016. By the third quarter, it had deferred about half of its 2015 deliveries into late 2016, with several including options for further deferrals in six-month increments, while also delaying two drillships from 2015 into 2017. But let me comment on that and say this is extremely important for us that it is a good solution for both the shipyard and for Seadrill because we also need the shipyards going forward. And also please don't underestimate that we also have a major shareholder in the Company that have other things going on in these shipyards. So, concluding on that one, I will say that it's not difficult. It's just a process we've got to go through. He's, of course, speaking of John Fredricksen, Seadrill's largest shareholder and a major player in global shipping, with significant pull with shipyards who count on business from Fredricksen's various interests. In other words, Seadrill has a real heavyweight in its corner working with shipyards. So far, that's helped it manage through its excess newbuilds as the downturn plays out. This is likely to remain the core of Seadrill's business over the next year or longer, with very little new work being contracted by offshore oil producers with prices so depressed, and global oil production far and away outpacing demand. At the end of Q3, Seadrill had $5.98 billion in contracted backlog directly, while the Seadrill group, which includes subsidiaries and joint ventures where other investors share in the proceeds, was $12 billion. Of the $5.98 billion that will flow directly to Seadrill, $4.52 billion of it is tied to its floating drillships, with an average contract duration of 21 months, and $1.46 billion from jack-ups over 15 months on average. Floaters like this drillship, as well as semisubmersibles, will provide the key revenues for Seadrill over the next year. Image source: Seadrill. Do the math, and that's $3.75 billion in backlog revenues Seadrill should expect to generate over the next year, before seeing a steep decline in 2017 as contracts expire. Put it all together, and Seadrill's backlog looks secure enough to generate enough cash flows to support the company into early 2017. But at the end of the day, until oil prices rebound in a sustainable way, any investment in Seadrill is going to be a race against time. Will Seadrill make it through the downturn? I want to say yes, and I'm leaning that way. If it does, the stock is a steal today. But the reality is, I'm making an educated guess on something that has already lasted a year longer than many experts expected. For instance, recent word of an agreement to cap production by oil states including Saudi Arabia and Russia could be indicative that the worst is behind us, but similar noises were heard about this same time last year, and you see how that's played out. And that, Fools, is the rub. I'll end this way: Seadrill should have enough cash flows to stay afloat for at least a year. Whether that will be enough to make it through the downturn is something only time will tell. Invest according to your willingness to take on that risk.